Today, we learn about baby 2! I'm now 5 weeks and 3 days on the way, if the pregnancy test I took this morning is accurate. We still have to confirm the news via ultrasound on December 1. We'll see what happens then! Occupy Wall Street (OWS) protesters have decided not to pay back students loans as a way to protest the high cost of higher education.Is this a good idea?Check out what Prof Bob has to say. Do you know what would have happen if we followed a federal balanced budget amendment?We would all be speaking German.Deficit spending allowed the federal government to finance World War II by selling “war bonds.”Our nation’s monetary policy allows the government to borrow (by selling bonds)to finance necessities and to smooth out the ups and downs of natural business cycles. 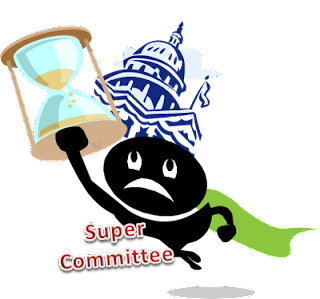 The deficit Super Committee deadline is Monday, November 21st, 2011. As the committee meets, I hope they are listening to some of those in the 1% who say they would not mind paying their fair share in taxes. I hope they listen to the 99% who want to see fairness in the tax system. I hope they listen to the majority of economist who say we should be borrowing and investing in infrastructure. Black Friday is less than a week away and there is no place I would rather NOT be than shopping at 4:00 a.m. when the stores open.I will be in my bed sleeping off a good Thanksgiving meal of smoked turkey and ham with all the fixings.But as we get into the season of spending, shopping and giving; here are some ideas to keep in mind. When shopping for gifts make a list and check it twice.Find out where you can get the best deal and make a budget for your gift giving. 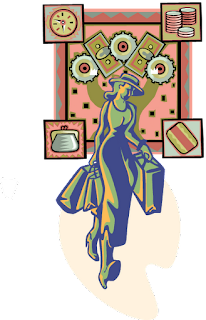 This may be a tougher holiday season financially so it is even more important than ever to keep both hands on your purse strings as you walk into stores playing holiday music and seeing displays that say “buy me!” Using cash and the envelope system of budgeting keeps you within your budget. This is what you hear as you get on an amusement park roller coaster. Maybe your stock broker or financial advisor should also say this when you begin to invest in the stock market. 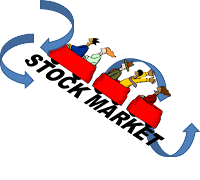 In the spirit of full disclosure, should we formally address the stock market by its thrill ride name? There is Disney’s The Twilight Zone Tower of Terror, Kings Island’s The Beast, Six Flags Great Adventure’s Kingda Ka, the Stratosphere Hotel and Casino in Las Vegas has Insanity, and the king of amusement park roller-coasters, Cedar Point in Sandusky, Ohio has Disaster Transport, Iron Dragon, Maverick, Mean Streak, Millennium Force, Raptor, Top Thrill Dragster and Wicked Twister. Any one of these names fit the gyrations, the ups and downs of the stock market. It seems like every time I turn on the television, I am bombarded with insurance commercials. 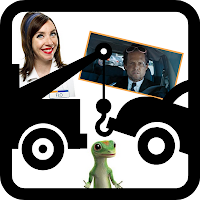 I see Flow offering discounts for Progressive, a gecko advertising for Geico, Mayhem causing trouble -advertising for All State Insurance and countless others. Most of the insurance companies are advertising their low rates; others make their distinction on service. Rates seem to continue to increase and it may not be my imagination. In the November 2011 issue if Smart Money, they state that auto insurance has increased 10% from 2008-2010, siting increases are due to the increased costs to repair a vehicle, soaring medical bills, increased probability of being in an accident, and increased number of uninsured motorist (now estimated at 16%). This week, two colleagues bade us goodbye. Since I got back, almost all of the staff I worked with previously have moved on to other job opportunities. It's quite sad and heartbreaking to see people go, especially those whom you have shared fond memories and bonded with over difficult and stressful client moments. But, realistically, that's just the way life is. People come and go. Change is inevitable. We all need to make choices and embrace changes sometimes, in order to grow and find ourselves and what makes us happy and gives us fulfillment. I speak from experience. This is just me trying to find a unique way to say, "so long".